New research shows that parents' exposure to toxic chemicals before conception has a negative effect on the health of their future children. 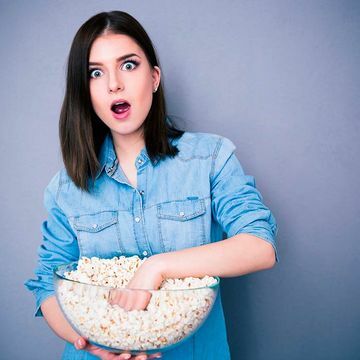 The list of what not to do during pregnancy seems unending, but if you've heard the one about not eating microwave popcorn, you might want to follow it—even before conceiving. A new research paper in the journal Endocrinology looks at how environmental stressors, such as the chemicals present in microwave popcorn bags, affect babies' future health even before they are conceived. The paper, which summarized almost 200 presentations from last year's 4th Conference on Prenatal Programming and Toxicity, says that future mothers' and fathers' preconception exposure to toxic chemicals may change how their babies' genes are expressed, resulting in a host of problems later on that researchers are just starting to be able to identify. "In the beginning, most emphasis was on cancer, then additional focus was on brain development," lead author Phillippe Grandjean, M.D., Ph.D., a professor of environmental medicine at the University of Southern Denmark and an adjunct professor of environmental health at the Harvard T.H. Chan School of Public Health, tells Fit Pregnancy. "Now, we realize that these types of effects may be relevant to the development of immune functions, future fertility, potentially all body functions as well as risks of disease, such as obesity, diabetes, heart disease. Worse, it can potentially result in transgenerational effects, i.e. effects that can be passed on to the next generation and the next again." So where are these chemicals coming from? Pretty much everywhere, it seems. "A large number of chemicals have already been identified as causes of developmental toxicity, and they encompass metals, pesticides, solvents, plastics components, air pollution, and many other substances," Grandjean says. "The big problem is that such effects have not been systematically looked for, and we should therefore be careful pointing at some specific chemicals that may turn out not to be the main culprit." Because regulatory agencies haven't considered the effects of long-term, low-dose exposure to many of these chemicals, laws aren't yet in place to protect people from them. The scope of how long before conception a baby may be affected isn't fully known. "We have incomplete knowledge at this time. New research has uncovered mechanisms that may allow changed genetic information to be transferred via sperm to the next generation so that the father's recent chemical exposure before conception may affect the fetus," Grandjean says. "In addition, many environmental chemicals are accumulated in the body over time, sometimes for several years. This chemical burden may affect the conception, or it may affect the fetal development later on, as the mother will generally share her chemicals with her child—and that continues after childbirth, as she may also excrete these substances in the [breast] milk." Although this all sounds pretty scary, there are measures we can take to limit our exposure to certain chemicals until regulatory agencies have caught up with the research and put new laws in place. and polychlorinated biphenyls (PCBs) in electronics and building materials. Avoid exposures to industrial chemicals, especially at work, "as occupational exposures will invariably be shared with the fetus." Choose organic foods, "at least in regard to fruits and leafy vegetables." Avoid using pesticides and solvents at home. Avoid plastics and food-wrapping materials, like microwave popcorn bags, which "can release chemicals that can pass through a mother's blood stream and into the fetus."